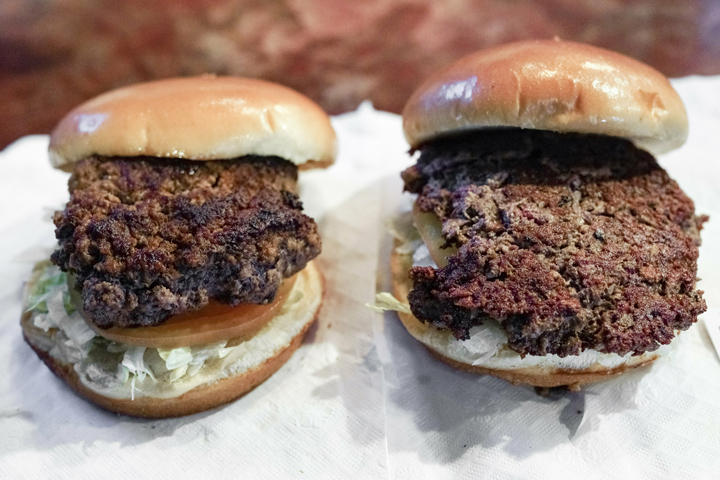 A conventional beef burger (left) is seen on January 11, next to “The Impossible Burger,” a plant-based burger containing wheat protein, coconut oil and potato protein among its ingredients. The ingredients of the Impossible Burger are clearly printed on the menu at Stella’s Bar & Grill in Bellevue, Nebraska, where the meat and nonmeat burgers are served. LINCOLN, Nebraska—More than four months after Missouri became the first state in the United States to regulate the term “meat” on product labels, Nebraska’s powerful farm groups are pushing for similar protection from veggie burgers, tofu dogs and other items that look and taste like real meat. Similar measures aimed at meat alternatives are pending in Tennessee, Virginia and Wyoming. They come amid a debate over what to call products that are being developed using the emerging science of meat grown by culturing cells in a lab. Supporters of the science are embracing the term “clean meat”—language the conventional meat industry strongly opposes. Nebraska led the nation in commercial red meat production in 2017 and had the most feed cows as of last year, according to the US Department of Agriculture. Livestock and livestock product sales generated an estimated $12.1 billion for the state’s economy in 2016, according to the USDA’s most recent available data.